Fall 2017 was a season of female empowerment on the runway. Naeem Khan's muse has often been regal and global. This season, that muse has skewed younger and more contemporary. There were luxe renditions of the pajamas as outerwear look. 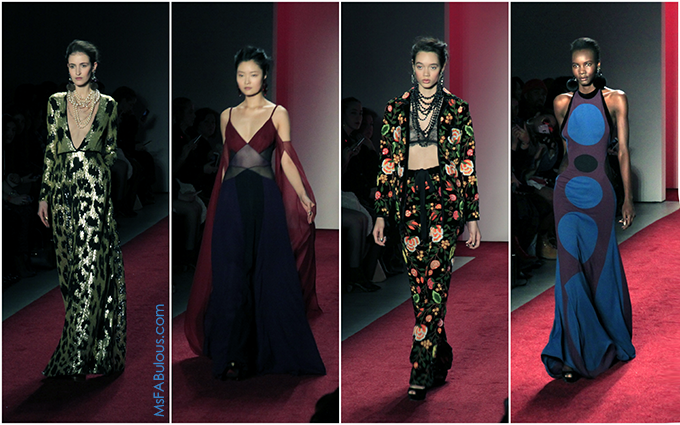 Relaxed, embroidered drawstring pants and tops, delicate, expensive lace bras underneath. Long gowns with more of a body-conscious silhouette with sheer panels or sleek silks with geometric graphics. In addition to elegant floral motifs, there were bold leopard spots in metallic sequins or lace. Oversized earrings and layered beaded necklaces of different sizes were a nod to tribal jewelry. At one point, the music stopped, and the soundtrack for this show was the voice of Maya Angelou, reading from The Human Family. Models of all ethnicities graced the catwalk in a range of colors and silhouettes. While literal ethnic costume references were not used, the subtle styling of each look was a tribute to the many cultures around the world. This was not an obvious political statement, but a stylish stance on the beauty of diversity. 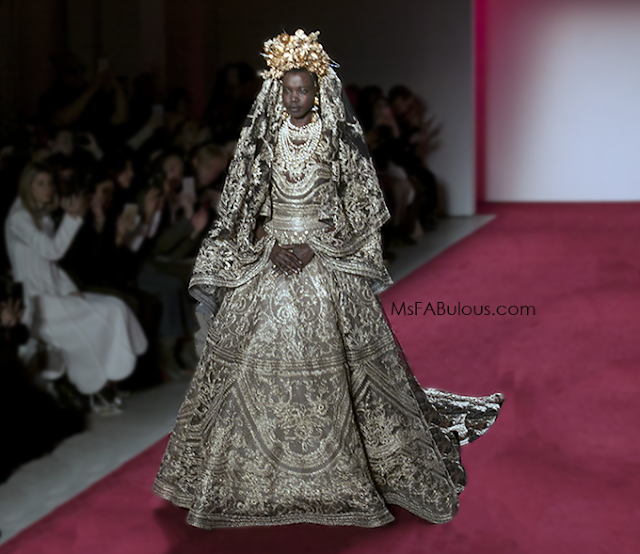 The finale of the show was a spectacular bride in gold embroidery and headdress who looked like an African queen floating through the venue. It was gratifying to see the majority of designers this season make a positive statement in one way or another. The fashion crowd rarely gets involved in politics. Some made deliberate moves to call out and publicly reject particular politicians. Others like Naeem Khan evoke the idea of inclusiveness by designing for a multicultural customer and sharing an iconic poem. The Human Family is one we all belong to.